Does your company sell functional safety related products or services? If you answered yes, then your company must have a functional safety management system. If your company does not have an FSM system your clients will stop buying from you in the future. Why? The latest functional safety standards require that end users must have procedures in place to verify the adequacy of the supplier’s functional safety management system. Do you as a supplier want to demonstrate in an easy way to each end user that you have a functional safety management system? 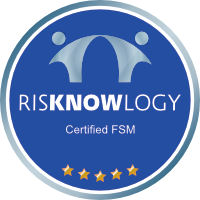 The Risknowlogy Functional Safety Management certification will pay off big time for you. Get certified one time and help the end user demonstrate compliance by submitting your FSM certificate. Easy for you, easy for the end user. Compliance for all. You need to have our company’s FSM system certified?